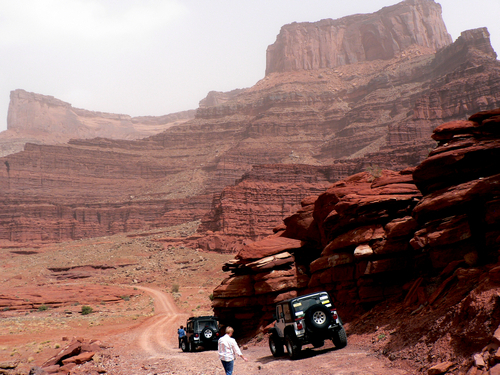 This is a fantastic Jeep trail for any vehicle with a bit of high clearance. Evaporation ponds, fantastic scenery and a good chance to see wildlife. Not a good idea to go on a dusty day. 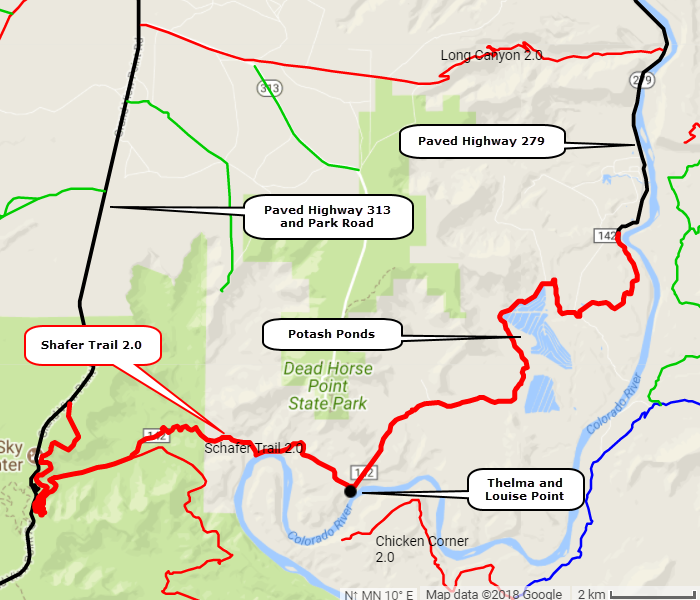 ​We usually start on the east end and finish in Canyonlands National Park, but the trail can easily be driven in either direction. 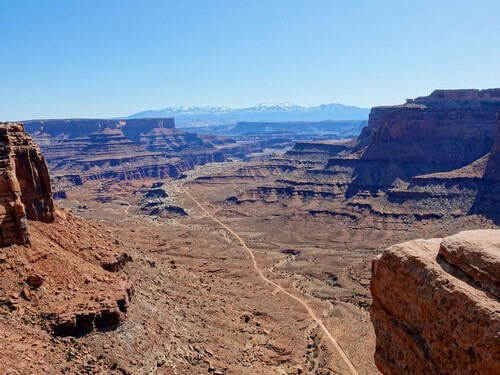 Note that the west end of this trail is in Canyonlands National Park. 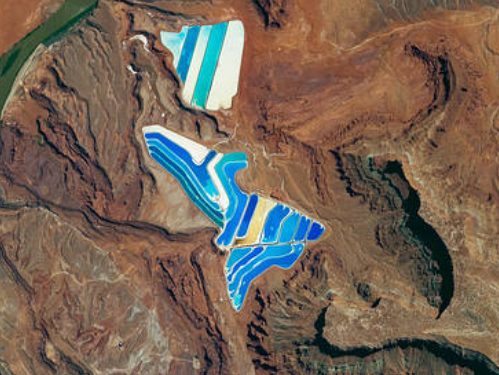 An astronaut aboard the International Space Station took this photograph of solar evaporation ponds along the Shafer Trail. There are 23 colorful ponds spread across 400 acres. They are part of a large operation to mine potassium chloride—more commonly referred to as muriate of potash (MOP)—from ore buried underground. MOP is in high demand as fertilizer because there are no easy substitutes for potassium, an essential nutrient for plant growth. ​River water is pumped into the mine and dissolves the potash, after which the brine solution is pumped to evaporation ponds. 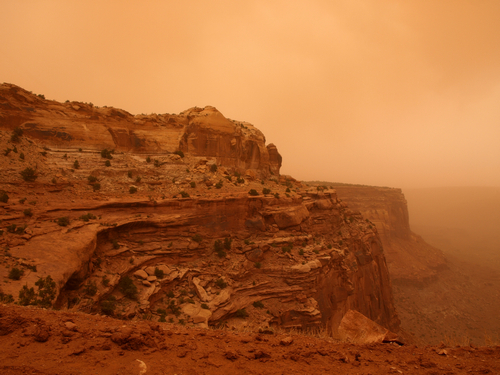 Each pond color indicates a different state of evaporation. The deep, royal blue color is due to a dye that is added to a full pond of potash brine and water in order to speed up the rate of heat absorption. The seafoam green colors indicate shallower waters (with less dye) that are well into the evaporation process. The tan colored ponds are nearly dry; salt crystals (the final product) are left over in the pond and ready for collection. 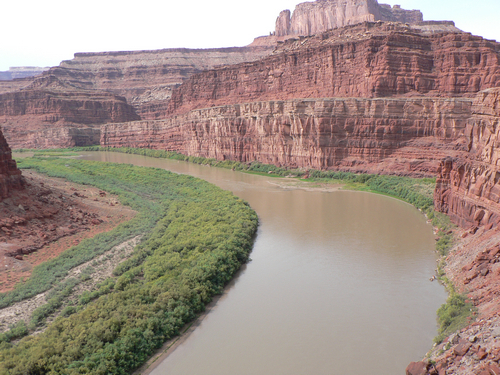 Much of this trail is on a shelf high above the Colorado River. Views are fantastic. Mountain views above the road are also beautiful, but not so much on a dusty day. 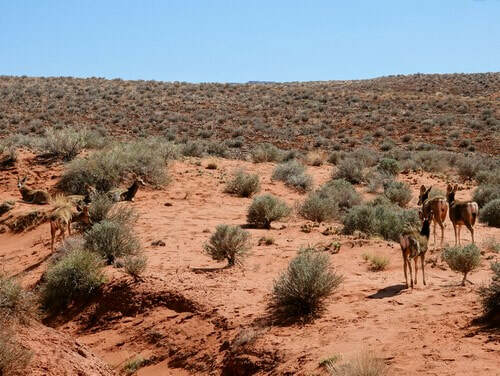 ​We have seen bighorn sheep and mule deer on this trip. Thelma and Louise is a 1991 movie with a climactic ending where Thelma and Louise drive their car off a cliff. Watch the final scene. Thelma and Louise Point is located by a waypoint in the gpx file. 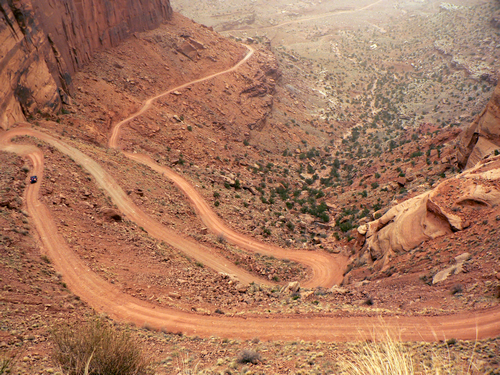 Continue along the rim and then climb up the switchbacks to the high part of Canyonlands National Park.